David Tasma, a Polish Jew and survivor of the Warsaw ghetto, died in 1949 in the care of a British nurse, Cicely Saunders. The £500 he bequeathed to Saunders contributed to the founding of the St Christopher’s Hospice in Sydenham, an institution dedicated to accompanying the dying and palliating what Saunders described as the “total pain” experienced by people at the end of life. The knot of Saunders and Tasma’s relationship, its opacity and sensuality, and the complex exchange of gifts, debt and obligations between them, lies at the heart of Yasmin Gunaratnam’s analysis of diasporic dying in Death and the Migrant. Gunaratnam draws on hospice ethnography, encounters with patients, narrative interviews with care staff, archival research, and her experiences teaching palliative care to investigate the ‘overlapping estrangements of migration, disease and dying’ (p. 8). Through elegant, elliptical, partly autobiographical analysis, she explores the vulnerabilities of migrants, how they can be ‘de-worlded by loss’ (p. 6), and how these losses, a withering of relations and winnowed down world of connection, can shape their experiences of growing old, falling ill, and dying. Migrants dying in the UK have often made extraordinary sacrifices for their ‘ordinary’ deaths among strangers. Gunaratnam’s research participants reflected to her on the experiences of estrangement and racism that attenuated their wellbeing, experiences that under some circumstances can position them as ‘difficult’ patients, seen by hospice staff and palliative social workers as hostile and obstructive. Gunaratnam describes her aims for the book as twofold: to investigate the philosophical implications of transnational dying and to produce better care, and her analysis braids together these two objectives moving seamlessly between these different registers. Indeed, the book is at its best when it diagnoses care. Gunaratnam draws attention, for example, to how the care available to minoritized people, while it might not be catastrophically failed, can lack the experimental edge that marks high quality care and how racism operates to constrict ‘the adventurous spaces of caregiving’ (111).Gunaratnam’s ethnography is a brilliant exposition of the work of ‘new’ or ‘cultural’ racisms (a frequently well-intentioned desire to accommodate cultural difference) creates attenuated intimacies and lacunae in caregiving. Caregivers are guided towards ‘appropriate’ deaths through a manual, the ‘culture GPS’, and extracts from caregiving manuals explaining and proscribing Hindu traditions of death are juxtaposed to nurses’ accounts of searching for and giving the best and most appropriate care; a more tentative, fraught and above all awkward process than the manual can anticipate or capture. For as much as the nurses and palliative social workers stress the importance of being attuned to the wishes of individual patients and the ethical obligation to give to those patients the death they have chosen – and there are a few stunning examples in the book of thoughtful care – there is, it is clear, a common-sense of a “British” way of death from which, in practice, it is difficult to deviate. Dying “quietly” (Gunaratnam is exquisitely attuned to the auditory life of the hospice) is a cultural expectation on the part of the nurses for whom a raw and noisy expression of grief can be received as an excessive demand on the attention of staff, as a stratagem. Silence, too, is important. In one of the books most moving and insightful chapters, an account of a young Kenyan man dying from HIV related cancers, Gunaratnam draws out the etymology of palliation that relates it to shrouding and to hiding. The book shows us how secrecy is a way of taking care of oneself when one has devolved many of the intimate functions of personal care onto professionals. The book is a masterclass in how to read qualitative interview fragments and how to convey to the reader the distinct singularities of each encounter, of interviews that were punctuated by lapses, by expressions of pain and grief, of the difficulty in living with and expressing total pain: ‘the pain that is accrued over a lifetime’ (p. 137). The textures of care on the ward are brilliantly evoked but the book does not neglect the intimate economies of care within families and in the home. Gender is of course crucial to the negation of this care but the stories Gunaratnam exposes are surprising. Home-based care for elderly men provides young Bangladeshi men, recent migrants to London’s East End, with a network of arrival and kinship. The status of ‘carer’ with its technologies, its apparatuses, its tender arrangements of dependency, offers a surprising and unexpected outlet late in life for a woman married to a controlling and volatile man. I learned an enormous amount from this book. I learned about the presence of the transnational stranger in the originary stories of care, how the NHS calibrates debts and needs and how the institution understands its own complex postcolonial history as a history of mutuality and obligation (the author’s father was part of the generation of migrants “called” to work in the NHS who are now dying under its care). I learned how borders open to those seeking work in the care economy and close to the circulation of exhausted, dying bodies and bodily remains from the UK to the “home” that remains elsewhere. Reading the book amidst the explosion of interest in ‘global health’ as an emerging field of anthropological engagement, I was particularly struck by how much this book has to teach us about mobility and globality. Stories of transnational dying, Gunaratnam argues, ‘complicate what we think of as migration, globalisation and care’ (p. 11). Medical anthropologists perhaps too frequently think and teach ‘global health’ as if it were the political economic bureaucratic structure given to us by international philanthropic non-governmental entities and not the complex and variegated conditions for living, working, flourishing, and dying for diasporic people and their families. This ‘fleshy account of geosocial politics from below’ (p. 22) clears a new path towards other stories. Branwyn Poleykett is a Research Associate at the Centre for Research in Arts, Social Sciences and Humanities at the University of Cambridge. Poleykett B. How did we get here? 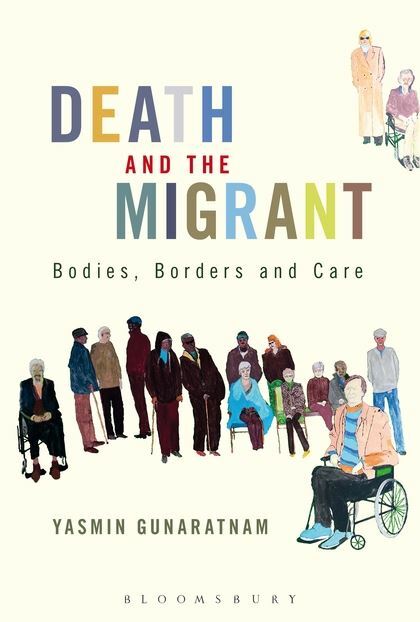 A review of Yasmin Gunaratnam’s “Death and the Migrant: Bodies, Borders and Care”. Somatosphere. 2016. Available at: http://somatosphere.net/2016/how-did-we-get-here-a-review-of-yasmin-gunaratnams-death-and-the-migrant-bodies-borders-and-care.html/. Accessed April 24, 2019. Poleykett, Branwyn. 2016. How did we get here? A review of Yasmin Gunaratnam’s “Death and the Migrant: Bodies, Borders and Care”. Somatosphere. http://somatosphere.net/2016/how-did-we-get-here-a-review-of-yasmin-gunaratnams-death-and-the-migrant-bodies-borders-and-care.html/ (accessed April 24, 2019).